Today marks the third anniversary of Sophie’s death. 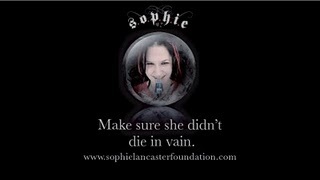 Sophie Lancaster was a Goth. She was also an intelligent 20 year old woman with a bright future. She was beaten up and killed simply for looking different in August 2007. The Sophie Lancaster Foundation was created to enforce a simple message; Stamp Out Prejudice, Hatred and Intolerance Everywhere. To show your support, please donate generously via our website or by buying the S.O.P.H.I.E wristbands and the cult ‘Sophie’ pencil. Last November, for what would have been Sophie’s 23rd birthday, the following video was made. Please view ‘Dark Angel’ here.